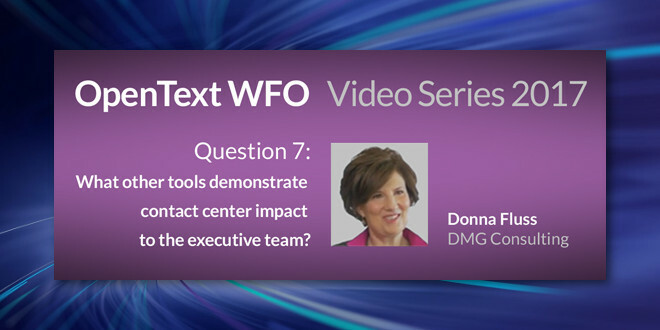 OpenText™ "WFO Video Series: What Tools Demonstrate Impact to Executives?" - Open Text Web Solutions Usergroup e.V. OpenText™ "WFO Video Series: What Tools Demonstrate Impact to Executives?" In my previous blog in this series for Question 3: How can the contact center align with the top priorities of executive leadership?, I started my comments with a quote from my favorite guru, Yoda: ““Do or do not. There is no try.” And I’m back to tell you that this bit of wisdom applies when it comes to the tools you need to implement to share the value of the contact center across your organization. Donna explains that this tool allows contact center leaders to quantify their performance and report into enterprise performance management (EPM) or corporate performance management (CPM) systems. This is important because, once the KPIs that executive leaders consider to be essential are agreed upon, they can be reported and shared throughout the organization on a timely basis.